If you’ve attended a PD workshop within the last five years, you may have heard how ” we are educating children for jobs that do not yet exist, to use technologies that have not yet been invented, to solve problems that we don’t even know are problems yet. ” This is one of many messages from the viral video Did You Know?, meant to shake educators from our perceived dogmatic and regressive slumber. In the last five years, reports issued by Institutes such as ISTE, UNESCO, OECD, ATC21s, and EnGauge, have responded to these challenges by placing ’21st Century Skills’ at the core of significant policy changes. These macro-level shifts are reflected in the recent ‘Next Chapter’ changes of the International Baccalaureate and the ‘Common Core’ standards recently introduced in the U.S.
For educators, these are exciting times, as we are situated in the midst of a paradigm shift, which affords both opportunity and risk. Adjustment, it seems to me, needs to begin with a clear and shared understanding of the key terms involved in ’21st century learning.’ We need to also recognise potential challenges to implementation, to avoid the cynicism that often arrives in the wake of failed initiatives. 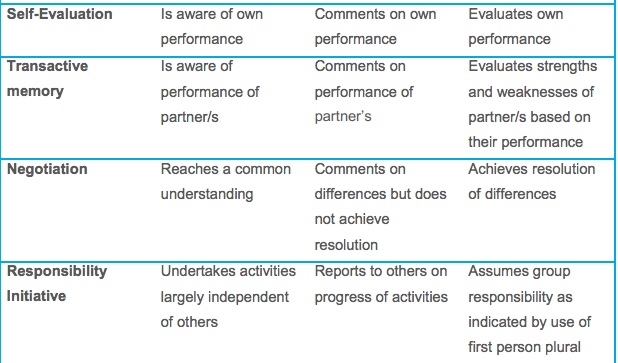 We also need to develop a framework for formatively assessing these skills, a framework that enables teachers to provide specific feedback to students for developing these skills, but that also enhances student agency by allowing for self and peer-based assessment. Or so it seems to me. Below is a brief sketch highlighting the ambiguous state of ’21st century education,’ and current efforts to address these concerns. As a teacher practicing within the IBO framework, I’ve been prescribed a set of skills to learn and teach called ATTL (Approaches to Teaching and Learning). 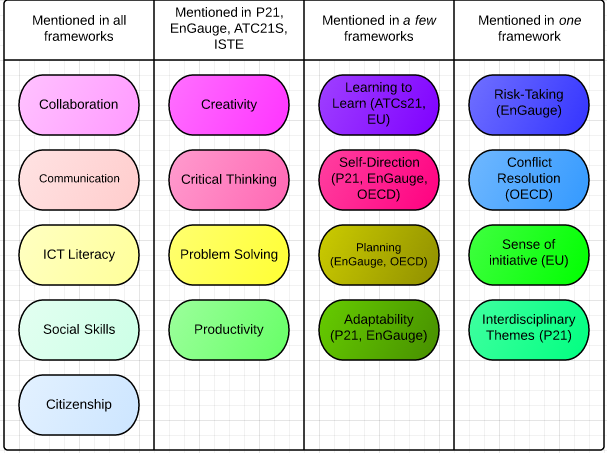 This framework aligns nicely with the competences identified above, in the far-left row, which all eight policy institutes agreed were essential. However, each skill contains multiple–in some cases infinite (‘social-skills’?!) strands. Though the IBO provides a list of strands related to each, it is also recognised that these strands should be context-specific, to meet the needs of learners in specific locations, at particular stages of development. This links to a second challenge for successful integration. A key issue identified by all frameworks concerns the role of teachers and their professional development (Voogt, J, and Roblin, N.P., 2012, p. 311). Teaching 21st century skills rests on the assumption that teachers possess the competences to be taught, and have a clear understanding of the mission before them. The IBO has provided indicators for teachers to identify and assess most of the core skills mentioned above (and a more comprehensive treatment will be available on the OCC soon). Yet, discussions I’ve had recently with IBO teachers and coordinators from Canada, Japan, Australia, and the U.S., suggest a lot of work needs to be done to support effective implementation. It seems that a policy to make sure teachers understand the rationale behind these changes, strategies to implement them authentically in the classroom, and a rubric to promote precise and constructive feedback from teachers and between students would be a useful phase one. For those fortunate enough to have strong learning support or curriculum development teams in place, perhaps the transition will be less rocky. For the rest of us, re-imagining PD, with an emphasis on developing a shared discourse and a community of shared practices, and using ICT to support more effective feedback, would go some distance in addressing the challenges ahead. As teaching practices often inform a teacher’s sense of professional and personal identity, strategies to encourage staff “buy-in” to unfamiliar methods might prove the most formidable challenge of all. Facilitating a growth mindset amongst the staff would be another key component of successful implementation. Of the frameworks mentioned above, Melbourne based ATC21S is actively pursuing models for assessing 21st C. skills. The focus thus far has been on rubrics for assessing ‘ICT literacy’ and ‘collaborative problem solving.’They prefer the term ‘collaborative problem solving’ over ‘collaboration,’ as effective team-work is typically aimed at reaching a specific goal–setting collaborative tasks that align with the insights of ‘problem-based-learning’ could therefore create the conditions for effective collaboration? As 21st century learning inches ever further to the core of our teaching practice, it is crucial educators reflect on both the opportunities and challenges. Developing a shared understanding of the rationale and skills involved, inter-disciplinary strategies for meaningful integration, and a rubric to empower both teachers and students capacities for assessment, seem to be necessary components for success. Attention to the psychological stress placed on teachers in the process of transforming their practice, and an awareness of the link between a teachers practice and their sense of self, could also promote a more sustainable integration. Would be great to exercise our own skills of ‘collaborative-problem-solving’ and continue this discussion here or elsewhere… Thanks for reading! Jake Voogt & Natalie Pareja Roblin (2012): A comparative analysis of international frameworks for 21st century competences: Implications for national curriculum policies, Journal of Curriculum Studies, 44:3, 299-321. Previous Previous post: Is ‘Inquiry-Based Learning’ too Narrowly Defined? Next Next post: Towards a social understanding of self-regulated learning.